SmartTargeting for mobile is the first app that allows real estate agents to get detailed insights on each home and homeowner in their prospecting territory from any iOS device, along with rankings of homes most likely to sell identified by SmartZip's patent-pending predictive analytics. With the launch of our new mobile app, clients now have a distinct advantage to take this powerful intelligence with them while they are in the field interacting with homeowners. "SmartZip is blazing the trail as it continues to add new ways for us to generate business," said Dan Keller of Keller Williams OC Coastal Realty. "This new app gives us tremendous advantage on the road. 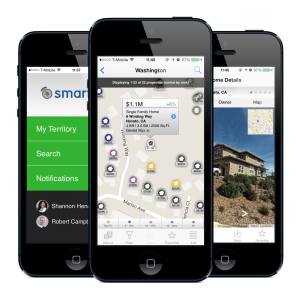 Whether we are out prospecting in our territory, or with clients who want to view and adjust their online home values, we can now access SmartTargeting data insights right from our iPhone or iPad." The All-New SmartTargeting Mobile App! Instantly view home and homeowner insights and adjust territory AVMs. Use map layers to view rankings, respondents, predicted listings and more. Search for specific properties and contacts. Filter based on key indicators, home attributes and transactions. Get lead notifications on the go. Add personal notes and photos for any property. Bookmark properties and contacts for easy access.